Panel clips are a kind of patio door hardware more often seen on aluminum patio doors. The panel clips hold the window panels into the frame. They are supposed to be mounted on the inside. I've seen some patio door installations where the panel clips were mounted on the outside. This is dangerous because any intruder can take the panel clips off with a screwdriver and slide the glass panel over and get entrance to your house. Keep the panel clips on the inside where they cant be tampered with. They can be plastic or steel. 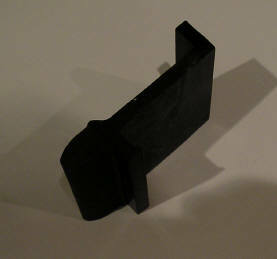 Plastic clips often have rubber bumpers molded into them so they act as stops for the sliding panel. Metal clips are the most secure because they are much more difficult to break than plastic. Panel clips have been made in all sorts of shapes and sizes over the years. But you can often find one thats close enough to fit when you are replacing a broken clip. You can even make them yourself by taking a piece of steel, about 1/16" thick would be plenty thick enough, and bending it into a "Z" shape using a vise and a hammer. On a patio panel the handles are often part of the locks and are mounted as one assembly. Some doors though have separate plastic or wooden handles screwed into the patio frames. Aluminum doors have most often have locks that are built into the sliding frame and have locks that operate by pushing a sliding latch up or down. This sliding latch has a latch hook attached to it by a screw. This screw often comes loose or falls out entirely. These latch hooks are very easy to replace simply by disassembling the two screws that hold the lock in place. Once the lock is removed its easy to tighten the latch hook screw or replace the latch hook entirely.